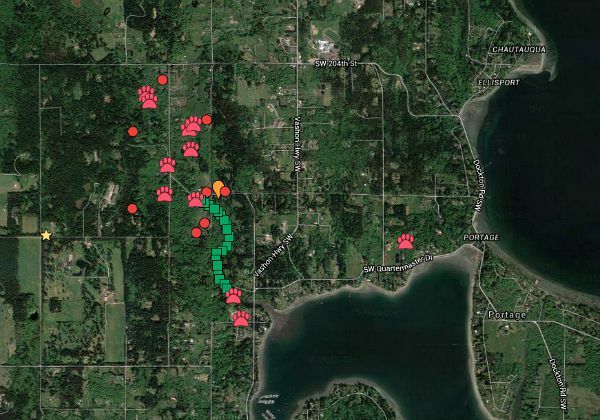 In terms of landmass, Vashon Island (37 sq. mi.) is about the size of Manhattan (34 sq. mi.). The north-end ferry connects Seattle, while the south-end ferry unites us with Tacoma. As slow as the car drives along the I-5 corridor that connects these two cities, the trek seems an interminable exercise in commuting. 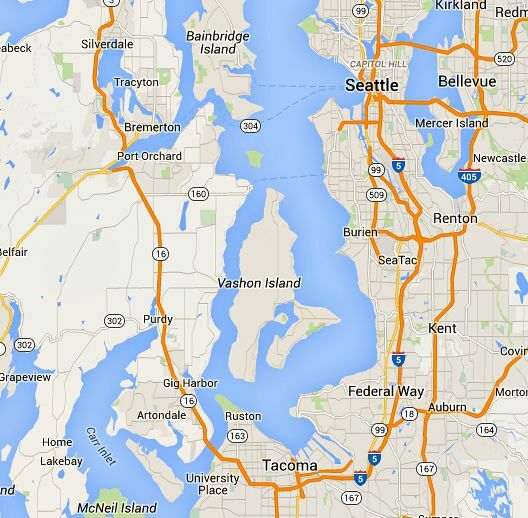 That said, I believe I’ve now made my case for just how big Vashon Island is. So when my friend BJ called to tell me his dogs Phoebe and Tillie had escaped the fenced confines of his acreage, my heart sank. You see, Phoebe is a Basset Hound and Tillie a retriever-setter mix, and their middles names are “Breakout” and “Explore” respectively. While Tillie would be complacent to stay home, and chase tennis balls, Phoebe has a nose and the will to sniff out any good or bad smell between her paws and Portland. 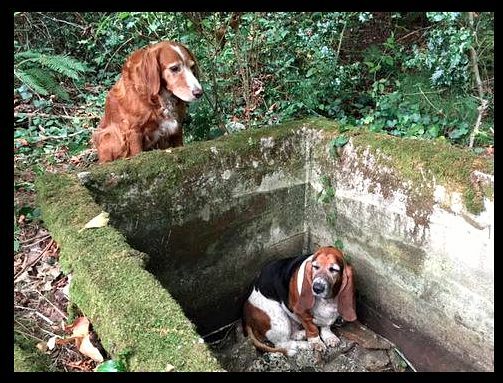 She is the Houdini of Basset Hounds. If she had thumbs and a credit card, I’m sure she would carry a blowtorch and buy ferry tickets. Tillie is her devoted companion; wherever Phoebe goes, Tillie follows. Because BJ is not on Facebook, he asked if I would help get the word out on the island through social media. We also contacted Vashon Island Pet Protectors (VIPP), an exemplary nonprofit on the island, where volunteers do more for pets, whether lost, abandoned, fostered, or ailing, then any animal advocate group I’ve ever come across. Phoebe and Tillie covered a lot of ground: home is the gold star on the left side of the map; found is the farthest paw on the right. As the hours and then, days progressed, the search continued, but just a few sightings surfaced. There was an encounter near Old Mill Road, a sighting by Judd Creek, and call in from Reddings Beach. One person commented that when she saw the gamboling duo, they looked as if they knew where they were going, so she didn’t think they were lost. Almost a week went by, and islanders involved in the search and the saga seemed resigned to that fact that this was not looking good for our beloved Phoebe and Tillie. Amy Carey, VIPP volunteer extraordinaire, had been through scenarios like this before, and felt the two were likely trapped, maybe in shed, or a barn, or ravine or even worse, an abandoned well. There was a collective sadness; anywhere I went on the island, folks would ask if I had any good news. The look on my face was answer enough. Later, I sat at home holding a reluctant Gracie, and not wishing the likely outcome on anyone, especially my dear friend BJ. Then, we got a message from Amy that one of our wayward island explorers may have been spotted. She made a beeline to the area, and let us know that Phoebe and Tillie had been found, and apparently there was quite a story to tell. I believe our cheers of joy could be heard across the Sound. Amy posted the following recount and photos on the VIPP Facebook page where we could all read and be amazed by this story with a surprise happy ending. MISSING DOGS FOUND!!! HOORAY FOR TILLIE…and a HUGE HANKIE ALERT. A few minutes later we found her laying beside an old cistern with her head resting on the concrete wall. Heart sinking…we knew that meant Phoebe was inside the cistern and every breath was held and every doggie prayer offered that the peek over the rim would somehow find her safe. And gratefully… this time we have a happy ending with dear Phoebe found perched on some concrete rubble that held her out of the water. For nearly a week Tillie stayed by her side with the exception of the few minutes of each day when she went for help. A huge thanks to Joe Curiel for realizing something was up and a round of applause to the awesome and amazing Miss Tillie. A true friend and a humbling example of the power of love. Tillie and Phoebe are now home, rested, fed and happy, as if nothing happened; but their safe return was thanks to the many engaged eyes, ears and hearts on the island, the super-sleuthing of VIPP volunteers, and the dogged efforts of Amy. Thank you all. And last but not least, Tillie and Phoebe will be getting new presents shortly: GPS Collars from PetTracker.com. Another great resource for lost dogs is lostmydoggie.com, which for a fee, depending on coverage, will set up robocalls to your neighbors and in your zipcode, detailing the lost pet information. Update: Phoebe and Tillie send their love and appreciation! And here’s a news clip of an interview with their owner, BJ, and the dogs in tow. omg…what a story and an adventure. so glad it ended happily! Thank you Karen, for the kind word and support. I’m still chuckling over the current star status of Phoebe and Tillie. That is unbelieveable! Who would have thunk? I just read this amazing story on a British website – Dailymail.com and I had to find out more about these two incredible dogs. What a testament to loyalty and unconditional love. Humans can learn so much from animals. I am so glad this had a happy ending!! If you have a chance you should read the comments section on the dailymail website, Tillie and Phoebe’s story has touched a lot of people. Thanks for the heads-up Sharon. I’m still gobsmacked over how this little local story could have traveled halfway around the world. Thank you for your interest and kind words, and sharing. I look forward to checking out the site and comments. haha…it’s been running all morning on the local news as well as GMA. Kelly, such a small world. Yep I love Phoebe and Tillie like my own dogs. 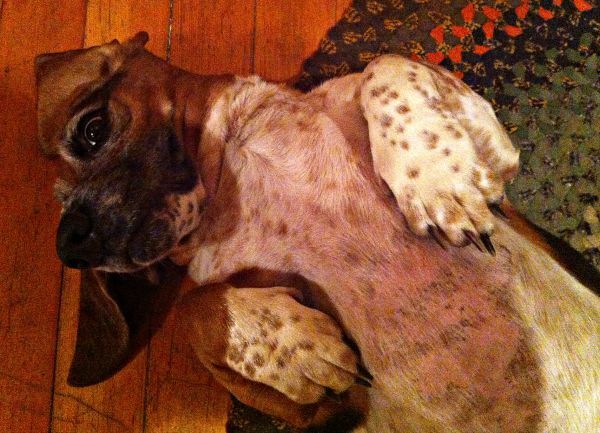 When BJ adopted Phoebe a couple years ago, Tillie just lit up like she got a new battery pack. They really are best of friends, like one giant inseparable furball on the sofa at times. Thank you for your kind words and love of our two little pals. Disney or Pixar could not have written a better script, or maybe they already have? (Incredible Journey). Bonds of friendship can extend to the animal kingdom, where they are sometimes more true than amongst the bi-peds! See ya Sunday! So true, Tommy. What a week; I was so fearful of a sad chapter in this story. Nothing but praise for Amy Carey and VIPP. Another great happy ending, Annie, but the stress to get there is the tough part. Thanks for sharing that great story. What a wonderful and charming story of true friendship. Thanks so much for filling in all the details! What a wonderfully happy ending! I’m so glad everyone in the community kept their eyes out for these two sweethearts. A thrilling story well-told that has brought tears and a lump in my throat. Hurray for everyone!!! Top trending story on Facebook-except they call Tillie an Irish setter. How fun to see this go viral! Seems like that cistern should be safer? Steak and belly rubs for Tillie! Phoebe & Tillie – what a story, I never get tired of reading it. Your addition Tom is truly wonderful. Had to pull out yet another hanky – time to do the laundry. Thanks again. We just watched this on the news. Thank God they were rescued. This story is everywhere here too Tom! The kids are very excited that they read it on your blog first. Thanks to the K9 God that this story had a happy ending. Yay Amy and VIPP! Wow Tom what an amazing story! Thank the heavens for all the kind folks and VIPP! Plus what incredible loyalty and love from Tillie in trying to save her beloved friend. Thanks for sharing such a heartwarming story! 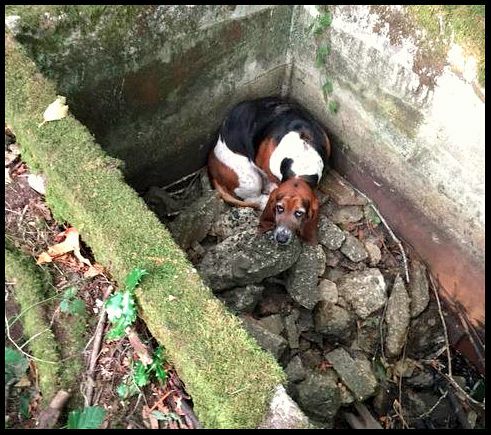 Our lovely island hosts many of these death traps–abandoned wells, cisterns, root cellars, basements–where dogs and other wildlife have met their fate. I recall the death of two beloved dogs in Lisabuela some years ago when they were discovered at the bottom of a well many weeks after the search was ended. By now, VIPP is probably aware of the location of many of these and hopefully some have been filled in but I’m sure there are many others undiscovered. Sometimes, depending on the depth, rolling a sturdy log into the hole can make a difference between life and death. Thank you for sharing this amazing story with its happy ending. Thank you Sue, for sharing your insight here. A couple years ago my neighbor filled in a hand-dug well obscured by brush that was not far from the street, no one even knew it was there until we had a near miss in locating it the hard way.